Operator parameters needed to create operator accounts in the AirVantage Management Service. You’ll also find here a short FAQ to help you resolve your most frequent questions. 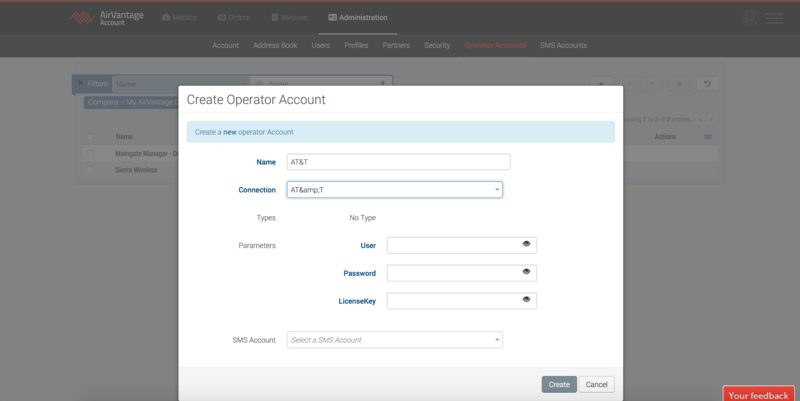 The table below lists operators you can interface with from AirVantage, and sums up a few important information about operator accounts, subscriptions and subscription management capabilities. The duration of a subscription management operation can last from few seconds to few days depending on the carrier. The operation will appear as pending in AirVantage until a response is received from the carrier. Please check the on-going operations prior to launch the same operation again. This section provides you with all parameters needed to connect with various operator systems and perform subscription and SIM management operations directly from AirVantage. These operators all use the subscription management platform from JasperWireless. As such, the configuration is identical to that described in the AT&T example. The integrations that have been performed for those 2 operators have customer specificities. Some additional development will be necessary to adapt to new customers and therefore the operator account cannot be configured as self service. If you need an integration with those carriers for 3rd party SIM management, please get in touch with your usual Sierra Wireless sales contact. For which devices and carriers does AirVantage Management Service support subscription management? 4G devices on Vodafone or Telus. 4G devices on Verizon Wireless are not managed by nPhase yet. Not available for subscription management in AirVantage. Does a customer need an Operator VPN to enable subscription management? No, AirVantage Management Service securely integrates directly with the carriers. Which operations can be done on subscriptions from the AirVantage Management Service?